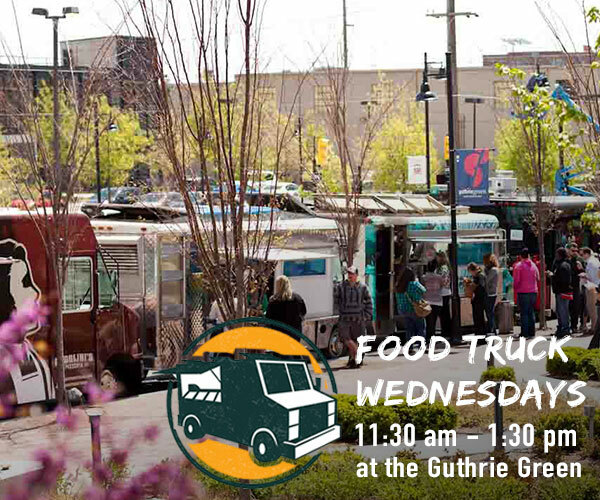 Home > Food Truck > Next Time You See a Purple Food Truck, Don’t Pass it Up! 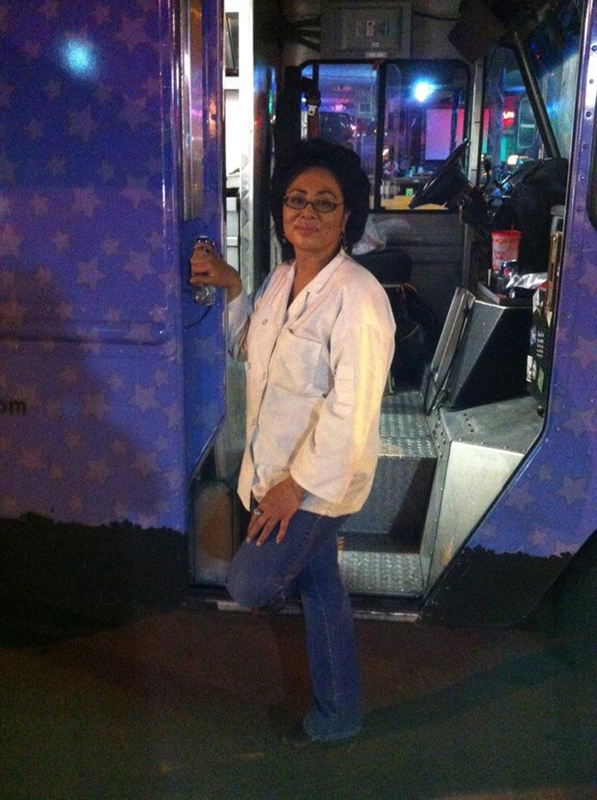 Next Time You See a Purple Food Truck, Don’t Pass it Up! If you see this purple lollipop of a truck and this lady is selling food from the back, stop and eat. If you pass it by, you’re missing something special. It’s not every day that you’ll find a food truck meal cooked and served by a graduate of one of the world’s premier cooking schools, the Culinary Institute of America. Teri Fermo (that’s the lady) pursued her culinary studies in Paris after that, and I think at some point she also spent time in the Philippines, because her menu shows a blend of Latin and Asian influence typical of that island nation. Teri runs a catering business, Bohemia, and she’d be delighted to arrange your wedding reception or other happy event. You can also order her food online from a very long and often-changing menu that currently includes such goodies as Diver Scallop Chowder, Roasted Fingerling Potato Soup with Truffle Oil, Guinness Stew with Black Angus beef and Yukon gold potatoes, two kinds of lasagna, cakes and cookies, and so on, all made with local produce. Happily for us, she also sells food from the back of a truck. She does the Cherry Street Farmers Market, she shows up at big sporting events both here and in the OKC/Norman area, but I never ran into her until last Saturday night. 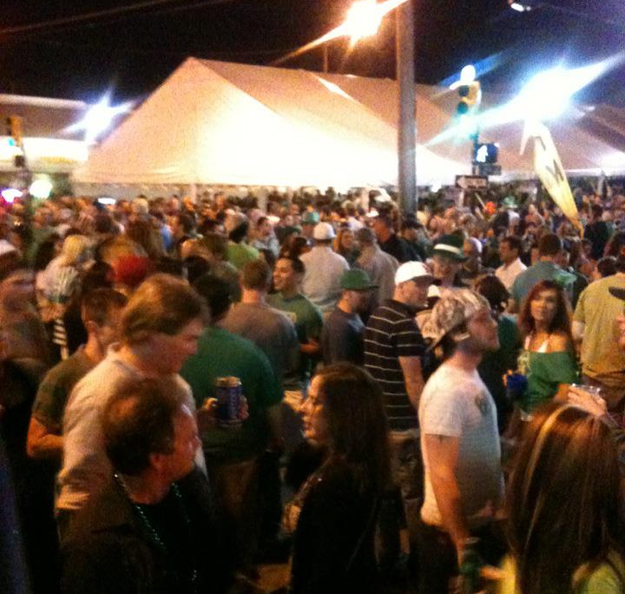 It was the first St. Patrick’s Day in five years to be on a weekend, and the last for five years too. Perfect weather, huge crowds downtown. And there, in the middle of the crowd, the purple truck, which incidentally is named Jezebel. Not that her arrival was a snap decision. The food must have taken at least two days to prepare, and that’s not counting the time to get the fixins from local farmers. And she works nonstop. She posted the menu online on Friday at 5:30 AM. “Menu will include corned beef with whipped potatoes and cumin jicama slaw ($8), fried grilled cheese sammy, a.k.a. ‘Cheese Frenchie’ ($5), Italian sausage sammy with caramelized onions and peppers ($5), Lumpia Shanghai, which are Mommy’s legendary ground pork spring rolls with sweet chile garlic sauce ($5), smoked Gouda mac-n-cheese ($5), sweet potato fries with grilled onion ketchup ($3).” I got the corned beef. So I tasted the corned beef and man it was amazing! I’m from New York so I have high corned beef standards. 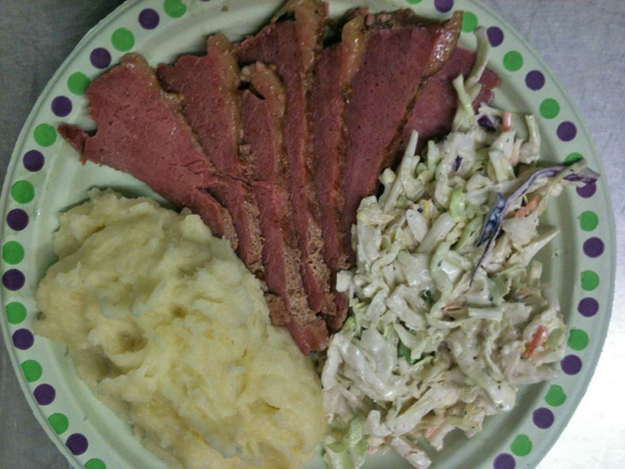 This was the first corned beef I’ve tasted west of, say, Ohio that I’d consider real corned beef. The rich and sumptuous flavor of those thick-cut slices was worthy of the best New York deli. Not that she used a traditional recipe. She improved on it! She brined the meat and then she braised it! It was simmered for hours. “I think braising does a magical thing”, she wrote, “to the little layer of fat on a brisket. Boiling doesn’t get it as gelatinous and luscious. Remind me a lot of what oxtails do when they’re slow cooked or pressure cooked. It’s the breakdown of the collagen.” Oh she was right! Not that the sides weren’t magical. The creamy mashed potatoes were addictive. They were made with Yukon gold potatoes, fortified with lots of butter and cream. The sprightly jicama slaw was a nice contrast. And then for dessert I had this. 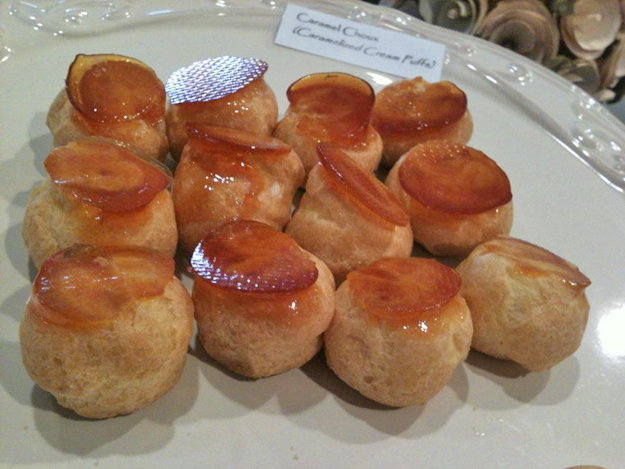 Caramelized cream puffs. Imagine a happy marriage between a cream puff and creme brulee. Fabulous. After my great meal, I asked Teri to send me a few words on her cooking philosophy. She sent me a great essay that’s worthy of publication. So here it is, in its entirety, and if you read it you’ll never pass her truck again without stopping. I am inspired by fresh, locally produced ingredients and am looking forward to the Cherry Street Farmers’ Market in which I have participated for the last seven years. I love the people who have worked alongside me to make our market an awesome one. I believe it is a jewel of our city. I love a challenge in the kitchen and have made a recent commitment to work with more unfamiliar ingredients. I really want to compete in the show “Chopped,” hence the newfound interest in broadening my culinary vocabulary. I am also motivated by creating beautiful food to accommodate special diets. I have offered gluten-free, casein-free, vegetarian and vegan items for a few years now, though lately I have been delving into diabetic friendly and low carb, high protein (Atkins diet) dishes because my best friend, father and I are in need of these. It makes me feel good to help someone who cannot eat just anything. And it makes me feel great to create dishes from a limited set of mis en place. I am a believer in that we eat with our eyes first and like to create pretty delicious food. I don’t seek to be merely competent, but exceptional. I want people to remember what I fed them. I always consider the visual aspect of food. As a caterer, I am inspired by bounty. My favorite style of service is the heavy hors d’oeuvres party. If left up to me, I would rather give a client 15 different savory and sweet items than the formulaic protein, starch, veg and dessert. As a food truck chef I have to consider my audience. For festivals and street parties, I like to do unique, portable fare with lots of sauce options. If I could only hold one position in the kitchen, it would be saucier. Stock is the foundation of sauce and sauce is the love of the plate. Everything else is technique. Regardless of venue, I like to have a good mix of different cuisines, both savory and sweet. I did earn associate and bachelor degrees in culinary art at the CIA, but I also earned pastry certification at Le Cordon Bleu in London and Paris. I did (and still do) a lot of traveling, which definitely inspires me immensely. I have moved around a lot, lived in a few places. And I still live like a gypsy–my house and boyfriend are in Norman and my kitchen is in Tulsa so I live out of a suitcase. And I burn up the turnpike. As an on line chef via the coop, I am called upon to cook and bake with local ingredients while accommodating a wide variety of clients. I love that I gain a statewide presence as the coop delivers my food to 30+ cities and towns in Oklahoma. Ultimately I feel my position as a chef is to serve. I believe my extensive experience as a waiter and bartender makes me uniquely qualified to serve–or rather, mind read. Service is all about anticipating the needs of a client before they know it. It’s about facilitating someone else’s good time. Service is not about me. It’s about you. It’s about pleasing you with the beauty of food and conversation and laughter. It’s about helping people celebrate life in that moment that we are together. While I do believe cooking involves skill, knowledge and experience, for me a lot of it has to do with attitude. I love my job and am grateful that I get to do it. And I have fun doing it. I am not a fan of an authoritarian culture anywhere. I sing and dance in the kitchen most of the time. When I have to buckle down and get things done, I get them done. Being a chef for me is hugely rewarding. There have been times when I haven’t been able to cook and I am lost without it. It has become my mission, my purpose: to please people with food. I like to under promise and over deliver. It has taken me a long time to find the love of my life, but he is here now. And I can honestly say my cooking has improved. Love is like that–at least for me. It has made me a better, more fulfilled person. It had made me a better cook. For real. So that’s my story and I’m sticking to it. Hope this helps you. Thank you, Brian, for helping me. It is people like you who make my job so gratifying. I speak enough Chinese to order food not on any English menu. Spanish French Italian too (not fluently but food-ently) My favorite restaurant is Jean-Georges in New York. But those NYC chefs would sell their soul to get the produce available from the farms around Inola. “A writer writes alone. His words tumble forth from a magical inner void that is mysterious even to himself, and that no one else can enter.” And yet, the most important thing to me the writer is YOU. Without you to hear them, my words are worth less than silence.